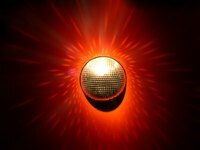 Disco balls can make for some fun decor for any party, or just around the house if you are going for a retro look. Instead of buying expensive disco balls at party stores or decor stores, try making your own disco ball at home with some simple steps and a few crafts supplies to achieve that disco-fever style. Blow up your balloon by blowing air into it, and use your scissors to cut off any excess rubber that hangs off the tied end without compromising or undoing the knot. Mix together in a large bowl your flour, water and white crafts glue until it makes a smooth paste without any chunks in it. You can use a large tongue depressor or even a paint stirrer to mix together these ingredients. With your scissors, cut strips of newspaper, about 2 inches thick and 10 inches long. A good measurement to begin with is to cut up an entire Sunday edition of your local paper, then cut more newspaper as needed. Submerge a strip of newspaper into your bowl of paste with your fingers or tongs, then lift the strip out of the paste and hold it above the bowl and carefully run your fingers down the strip of newspaper to let any excess paste drip back into the bowl. Place the strip on your balloon using your fingers to gently smooth out bubbles. Repeat Step 3 with another strip and continue working your way around the surface of the balloon until it is completely covered in strips of newspaper. Put the ball in a large bowl to dry for two hours and put the paste in the refrigerator. When the first layer is dry, apply a second layer of newspaper strips, cutting out more newspaper strips if you need them and using your leftover paste. Mix a new batch of paste if you need more. Let this second layer dry for another two hours, remembering to refrigerate the leftover paste while the layer dries. Apply a third layer of newspaper stripes, again using your leftover paste and mixing new paste as needed. Refrigerate paste when done and let this third layer dry overnight to insure that all of the layers dry and harden. Spray paint your ball with silver spray paint outdoors or in a well-ventilated area and let dry for an hour. Spray on another layer of paint to ensure that all the newspaper type gets covered completely. Allow another hour to dry. Dip a thick artist’s brush into your paste or mix a new batch if you are out of paste, and begin applying it to a section of your silver ball. Sprinkle a generous layer of silver glitter over the area where you applied the paste layer. Continue applying paste, following immediately with glitter, until half of your ball is covered. Place the ball in a large bowl with the unglittered side down so the glitter and paste on the other side can dry. Let it dry for two hours. Apply paste and glitter to the other side of your ball, and set it back in the bowl, wet side up, for another couple of hours to dry completely. Spray your entire ball with a layer of shellac sealant spray and let dry for an hour. Use a knife to poke two small holes atop your ball for threading string through and hanging. Make holes a half an inch apart. Don't worry about popping the balloon inside, as the newspaper shell will be strong enough to hold the round shape on its own.